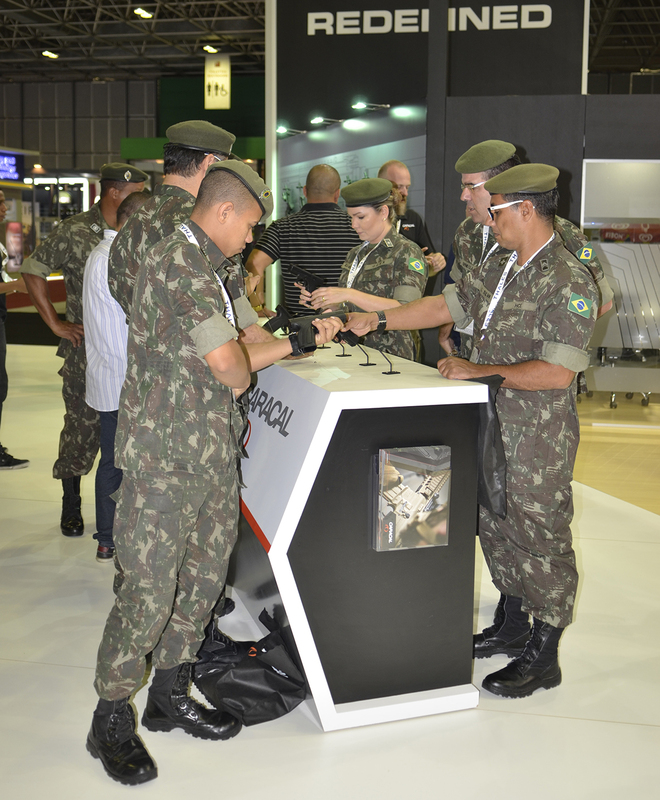 LAAD Defence & Security 2017 which took place at the Riocentre in Rio de Janeiro, Brazil is the largest and most important events of its kind in Latin America. From the outset, it was admitted that 2017 would be a challenging year for the defence sector in Brazil. 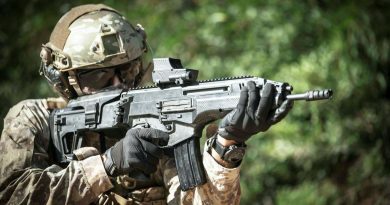 The Ministry of Defence and Armed Forces delivered updated versions of the National Defence Policy and the National Defence Strategy which will result in a slow down in defence spending. In addition, the Federal Government has already announced, for example, a US$141.1 million investment in the Border Integrated Monitoring System and the March 2017 launch of the geostationary Communications and Defence satellite. These announcements were against this backdrop that the 11th edition of LAAD took place from 4 to 7 April which was noticeable smaller than LAAD 2015 with fewer external displays of helicopters and vehicles. However, with more than 400 exhibitors from 20 countries at the event offered solutions from problems in areas such as aerospace and naval engineering, personal and tactical equipment, training, cyber defence and security, counterterrorism, communications and surveillance. No real large smiles were to be seen anywhere at LAAD 2017 as very few new business contracts were trumpeted in the four large hall of the exhibition. Taking into account the difficult economic situation now experienced by the Latin American giant, many if not all national defence programmes are being slowed down to the limits if not put on hold for a year or two. Indeed, as Brazil has now to cope with more pressing social issues, the present government of Michel Temer has its eyes focused on next year’s presidential elections, and nothing else ! As expected by military experts, both President Michel Temer and Minister of Defence Raul Jungmann took advantage of their visit at LAAD’s Riocentro to announce nothing else… than further cuts in the country’s already tight defence budget. With some 20% less funds to count on in 2017 and 2018 squaring out many programmes will become arduous even though Brazil’s defence budget should remain the largest in Latin America. Interviewed during LAAD, President Michel Temer reckoned that his country faces a period of “fiscal adjustements” during which it has been necessary to reevaluate national expenditures taking into account more closely the country’s revenues with a focus on priorities like Education, Health and Public Security. Nevertheless he said : « We are now fostering the strategic projects of the Brazilian Armed Forces, which were slow-paced under the previous administration due to the lack of resources. The payments made in 2016 were significantly higher than those of 2015. While 16.5 billon reais were disbursed in 2015, this figure raised to 21.3 billion in 2016 which represents an increase of 4.8 billion. » For Temer no other field today is more crucial than the protection of Brazil’s borders in order to combat illicit activities, that is to say that only security and defence assets directly related to this matter — SISFRON (border protection) and ProSub (maritime protection) — should remain safeguarded during the critical economic downturn witnessed by the country. Having failed in achieving much success with some of its autonomous defence programmes before and during the Lula and Dilma presidencies — with some dramatic and costly failures in the space launcher field for example —, Brazil has now adopted more pragmatic ways to develop its defence industry and projects through international cooperations and partnerships mainly carried out with various companies from Europe, Israel, Russia and the USA. Brazil’s key industrial partners are of course still Airbus and its local Helibras company — the number one rotorcraft producer in Brazil and Latin America —, but Thales, MBDA and Safran, either directly or indirectly through a number of their local subsidiaries and joint-ventures, are also major partners. Just like it is the case in India today, Brazil insists on having all its defence equipments made or assembled locally. Not only for economic reasons, but also to develop an intelligent approach to new technologies it wants its engineers to master, all in a process of balanced cooperations. One of the most important is the ProSub submarine programme signed with DCNS of France in 2009. This major contract — amounting $7 billion — relates to the construction of four Scorpene 2000 conventional attack submarines in Brazil through a technology transfer structure (garanteed for 30 years) established directly with the Marinha do Brasil. Today the first submarine hull is complete and awaits its equipments and systems while the others are are in various stages of construction at Itaguai, near Rio de Janeiro. Although now delayed due to financial constraints, the programme is underway and even includes the construction, at Cherbourg in France, of the hull and systems of the first Brazilian nuclear-powered submarine which is due to be launched by the end of next decade using a nuclear engine entirely developed in Brazil by CTM in São Paulo within the Amazul project. Linchpin of the SISFRON border protection system is space, the one field Brazil wants to be preserved from budget cuts, Temer insists. Satellites for the Latin giant are considered strategical and beneficial as well to civilian applications. Brazil being a country with a clear space orientation, it has made close relationships with such companies as Airbus Defence & Space (ex-Astrium) and Thales Alenia Space, the most important European actors in this field. For the moment, the ongoing general strike in French Guiana which is still hindering the launch of the Visiona satellite is considered a true setback. In the absence of a guaranteed order for a second geostationary satellite, Brazil’s emerging domestic satellite manufacturer Visiona Tecnologia Espacial is building up a remote sensing business and weighing a small satellite project in order to gain more experience. 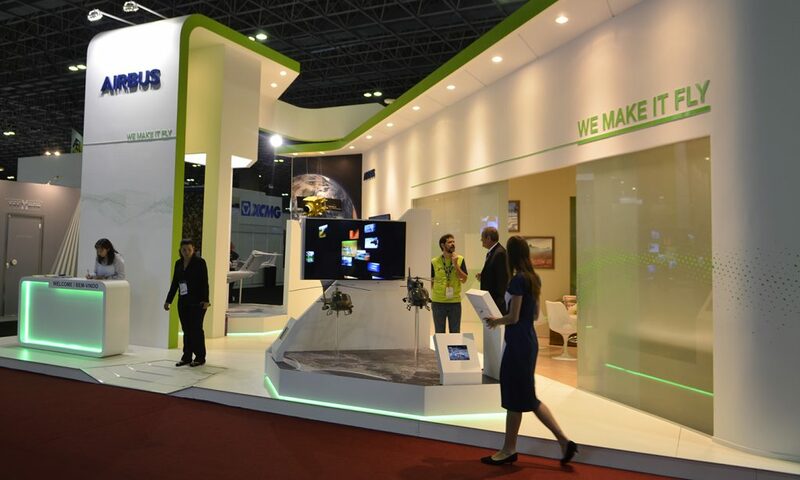 Established in 2012, Visiona is a joint venture between Telebras Telecomunicações Brasileiras and Embraer Defense and Security tasked with cultivating a geostationary satellite manufacturing capability in Brazil. The company’s flagship project is the Geostationary Defense and Strategic Communications (SGDC) satellite, a Ka- and X-band spacecraft for Telebras and the Brazilian Ministry of Defence constructed in partnership with Thales Alenia Space of France. Initially and before the global strike in Cayenne and Kourou blocked all activities, SGDC was slated to launch by end of March, toward the end of a six-month window with launch provider Arianespace on an Ariane 5 rocket. Visiona awarded the SGDC contract to Thales Alenia Space in the fourth quarter of 2013, which included a technology absorption programme organised by the Brazilian Space Agency that let more than 65 Brazilians work alongside Thales experts in France. Visiona received the finished satellite earlier this year, having it shipped to French Guiana in February. Visiona worked as the interface for Telebras and the Ministry of Defense to help design the satellite and integrate the payloads into a Thales Alenia Space’ Spacebus 4000 platform. To prevent a loss of momentum, Visiona is considering a satellite project in low Earth orbit that would allow the company to showcase its manufacturing abilities until other avenues of business become clear. Visiona’s background is in low Earth orbit satellites. Much of the company’s technical acumen came from INPE, Brazil’s National Institute for Space Research, which has built several remote sensing spacecraft and led Brazil’s half of the China-Brazil Earth Resources Satellite (CBERS) series. The latest such satellite, CBERS-4, launched in December 2014 on a Chinese Long March 4B rocket. SGDC is Visiona’s first geostationary satellite project. The company would not have been able to complete the project without the support of Thales Alenia Space, which helped build the satellite and its ground stations in Brasilia and Rio de Janeiro. A smaller satellite, however, is something the Brazilian company believes it can complete on its own. The idea is to use a Visiona platform that could fit into data collecting, remote sensing or strategic tactical communications and optical applications. Visiona has also formed a new business unit called Observation Services that stitches together imagery from international satellite operators with coverage of Brazil. It has partnerships with Airbus, DigitalGlobe, Restec (Remote Sensing Technology Center) of Japan, South Korea’s SI Imaging Services and UrtheCast. Visiona’s imagery partners were represented in Brazil in the past, but the volume of business was too little to justify having a large individual presence. With the combined resources of the five imagery providers, the company has optical coverage of Brazil ranging from 0.3 to 25 m, and radar from 0.25 to 50 m, as well as access to UrtheCast video from the International Space Station. Visiona is marketing this service to Brazil’s Ministry of Defence, but could also build a dedicated satellite constellation if they preferred a proprietary system. Visiona is pursuing customers with this imagery business in addition to trying to find additional customers who might buy satellites. Among future satellite plans is the SGDC communications satellite designed primarily for government services. Its 50 Ka-band transponders are meant to provide full coverage of Brazil mainly for digital inclusion programs to bring internet access to remote parts of the country. The seven X-band transponders are for military applications. Should Visiona obtain another geostationary satellite contract, be it an SGDC-2 or something else, the company would seek to build more of the satellite with Brazilian parts and labour. This would likely involve using an assembly, integration and testing facility through INPE. Thanks to skills gained with SGDC, Visiona would be able to build more composite materials, participate in building solar arrays and construct some of the power system for its next geostationary satellite project, whenever one starts. Although present in numbers at LAAD — with the sole exception of Saab who showcased a 1 :1 scale model of its Gripen BR and Dassault Aviation noted for its absence — most of the leading European companies only had display stands of reduced sizes with little or no true novelties. For the very first time KMW of Germany and Nexter of France exhibited under the new KDNS logo as a single company. Quite a change ! 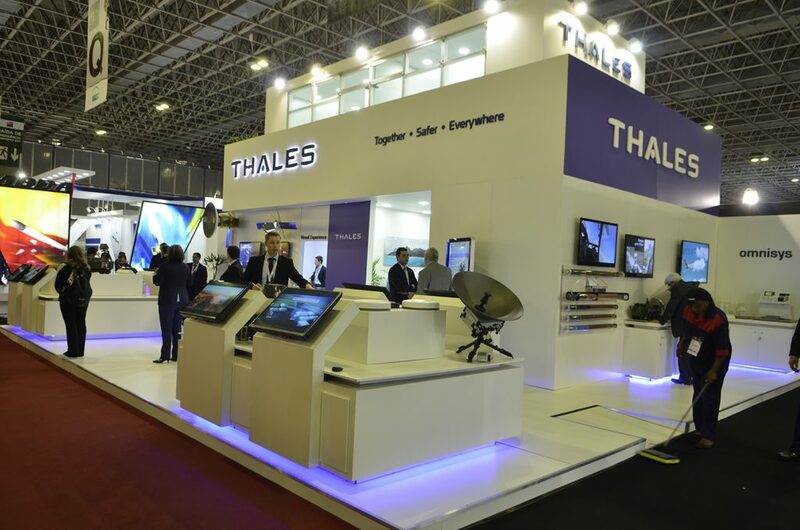 Both companies showcased in a very diplomatic mode scale models of « non-competing » vehicles with tanks only for the German side and IED-protected APCs for France… A new Thales aircraft radar was not on exhibit at LAAD however, being present only in the news aired around in Brazil. Last March, the first in the series production of Thales Searchmaster multi-role surveillance radars was accepted and declared ready for delivery to its first export customer, in line with production timescales. This new radar will equip the Qatar Army Optionally Piloted Vehicles – Aircraft (OPV-A) and respond to its land and naval surveillance requirements. The Searchmaster multi-role surveillance radar is the first multi-role light radar developed in its category (under 80kg) to meet the needs of both maritime and ground surveillance as well as providing tactical air support in both of these environments. Using Active Electronic Scanning Antenna (AESA) technology, the radar is tailored to fly on all platform types, and it is earmarked for much commercial success over the coming months as it is of the « 5 in 1 » type and highly adapted to retrofit mounts. Let us recall that the Searchmaster was also selected in 2014 by the French Defence procurement agency (DGA) as part of the Atlantique 2 (ATL2) maritime patrol aircraft upgrade programme for the French Navy. The production of the radar was launched in 2016 at Thales Campus in Bordeaux and several international customers have already selected the radar for their requirements. Truly enough for MBDA, LAAD 2017 did not come with any news from Brazil. Instead with the end of the Sea Skua missile in the UK — decommissioned a few days ago after some four decades of service —, the British Royal Navy now expects the arrival in its inventory, within two years, of its successor, the Sea Venom/ANL antiship missile, a deadly IR-guided 110kg weapon largely immune to any existing countermeasures. It was announced during the show that MBDA has successfully conducted air carriage and jettison trials of this new cutting-edge anti-ship missile on board a Lynx Mk 8 naval helicopter testbed. The trials have validated that the missile can be integrated onto the Lynx and Super Lynx helicopters, which remain in frontline service with many customers worldwide. The Sea Venom/ANL has been developed to deliver an enhanced capability to replace existing and legacy systems such as the UK-developed Sea Skua and the French-developed AS15TT anti-ship missiles. Working together through the Defence Growth Partnership (DGP) initiative, the trials were conducted by MBDA in collaboration with the UK Defence Solutions Centre (DSC), the Royal Navy and QinetiQ. The trials were undertaken in March at the Larkhill Range at Boscombe Down, and saw a Royal Navy Lynx Mk8 successfully conduct a series of air carriage trials prior to jettisoning two Sea Venom missiles fitted with telemetry kits. The outcome of the trials has been a de-risking of the integration process of Sea Venom on both the Lynx and Super Lynx helicopters for the export market. The 100 kg-class missile is one of the products of France and the United Kingdom’s highly-successful collaboration on missile technologies. In UK service the missile is planned to be used from the AW159 Wildcat helicopter, while in France the DGA (Direction générale de l’armement – the French defence procurement agency) is currently conducting the development flight campaign for the missile on a Panther test bed helicopter. The new trials on board the Lynx Mk 8 validate that the missile can be easily integrated onto any platform. The Sea Venom is a modern primarily anti-ship missile designed to destroy vessels ranging from FIAC (Fast Inshore Attack Craft), through medium sized FAC (Fast Attack Craft) up to large vessels such as corvettes from safe stand-off ranges, but it can also be used against land targets such as HQ buildings or radar sites. Unlike legacy semi-active radar guided missiles, Sea Venom uses an imaging infrared seeker that offers ‘fire-and-forget’ capabilities in even the most complex littoral environments. 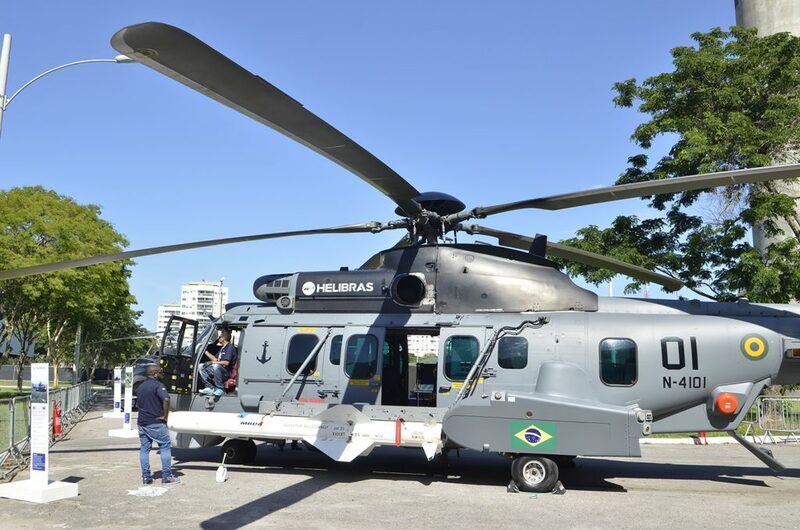 Many small European aerospace and defence companies are active in Brazil, providing that country with valuable equipments altogether with precious foreign know-how. 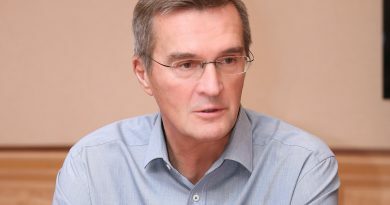 An interesting viewpoint about Brazil’s struggle to continue developing its aeronautical and military programmes in cooperation, despite the country’s severe ongoing crisis, is that of Bertrand Lucereau, international director of Secaleap, a company of the Zodiac Aerospace group (member of the Paris-based GIFAS) which provides services to Brazilian aviation companies active in the São José dos Campos region — the aviation heart of Brazil. For Lucereau Brazilian aerospace industry remains a promissing field. Brazil produces excellent aircraft, and a jet cargo like the Embraer KC-390 is a unique and valuable airlifter as does the new line of Embraer « E2 » commercial jets. As such there is no reason to abandon the stage eventhough contracts are difficult to sign nowadays and local red-tape of a very… Soviet-like nature ! 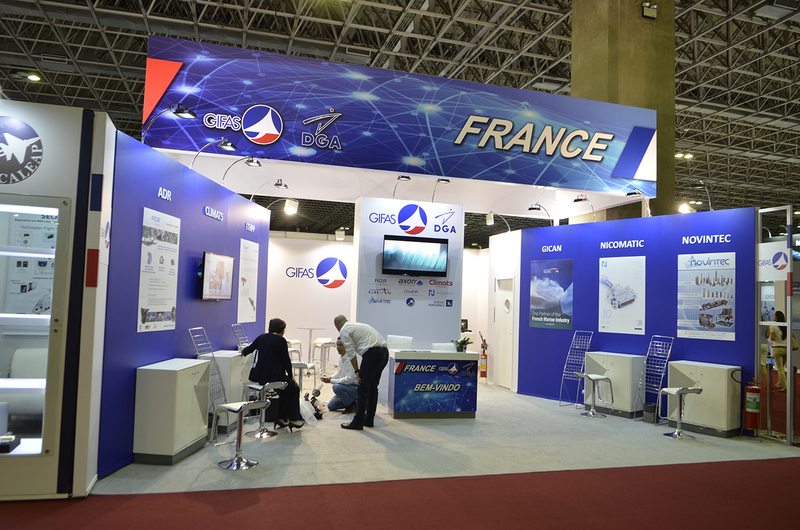 The Brazilian economic crisis is not set to last forever, and there remains there (even today) many niche markets for which French aerospace companies could strike deals with local partners. 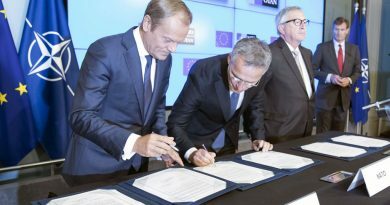 Provided the French government, through its COFACE agency — and just like it does for larger industrial groups like Dassault, DCNS, Thales or else —, would accept to provide payment warantees for SMEs as well. But this will certainly have to wait until France elects a new president with a true interest for export ! The answer to this question will be one of the most acute ones at the coming Paris Air Show next June. At a press conference at LAAD, Brazil’s Defence Minister Raul Jungman detailed a number of budgetary cuts reflecting directly on R&D investment for the three armed forces while the main programmes including PROSUB, SISFROM, Guarani, Gripen E, KC-390 and the Geostationary Defence and Communications Satellite were guaranteed funding in 2017. Many of these programmes involve partnership with overseas companies including the Embraer KC-390 military tanker transport aircraft whose partners include companies from Argentina, Czech Republic and Portugal. 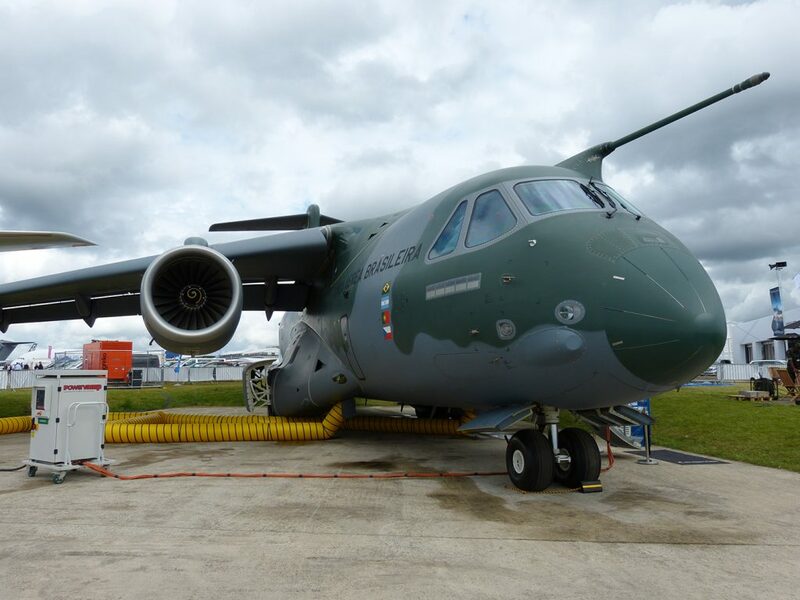 The KC-390 is just months away from receiving it certification with two prototypes undertaking an intensive schedule of test flights aimed at entering service with the Brazilian Air Force in 2018. In February this year the aircraft successfully completed the first dry contact run and the beginning of March, the two prototypes had logged more than 900 flight hours. 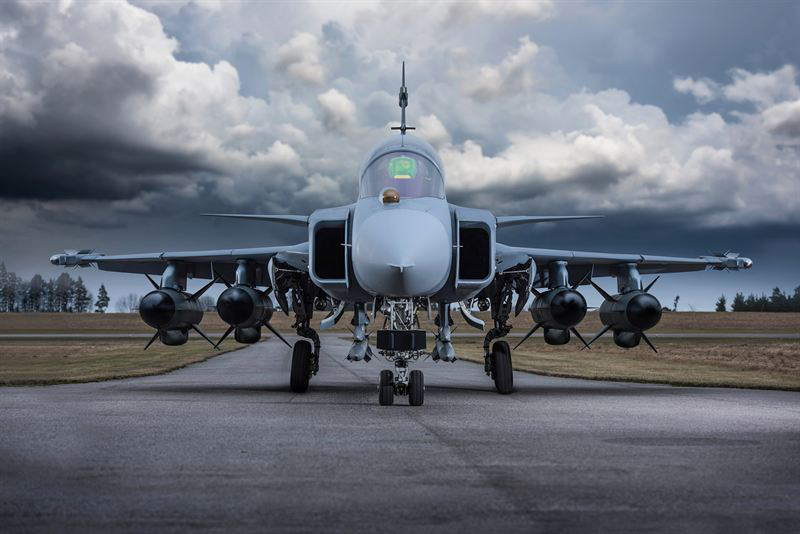 Saab is a major player in Brazil’s defence sector with the Brazilian Air Force procuring 36 Saab Gripen E/F fighter aircraft, a large percent of which are being produced by Embraer and other Brazilian companies. The national industry is already benefitting from the Gripen technology transfer programme that has been in place since October 2015. Up to the present time, around 150 engineers have participated or are participating in training programmes in Sweden. More than 30 have already returned to Brazil and, by 2024, there will be more than 350 Brazilians trained. Gripen E wings, front and rear fuselage and airbrakes are being built in Brazil which is also developing the two-seat variant. In addition Saab has completed the final design study of the carrier-borne Gripen M variant with Embraer. In the maritime sector Saab was promoting its range of mine countermeasure vessels, underwater ROVs, while its weapons division highlighted the new RBS 70 NG air defence system which has been ordered by the Brazilian Army, and the new generation of the RB15 anti-ship missile that is being integrated on Gripen E.
During LAAD 2017 Savis and Bradar, affiliated companies to Embraer Defense & Security, and Rockwell Collins announced a cooperation agreement to jointly evaluate business opportunities in defense applications. This included the radar technology integration into the Rockwell Collins FireStorm system which will enable Savis and Bradar to have the potential to extend the protection and situational awareness of the troops providing early warning of potential threats. This integrated solution provides an option to augment the capability to offer both close air support and troops call for fire, being capable in the future to operate integrated with attack aircraft, such as the Embraer A-29 Super Tucano. Benard Tan, Chief Marketing Officer of ST Engineering told EDR that Brazil is good centre for the company. He said that ST Engineering is not taking a short-term view when budgets are low but are in Brazil for the long term. 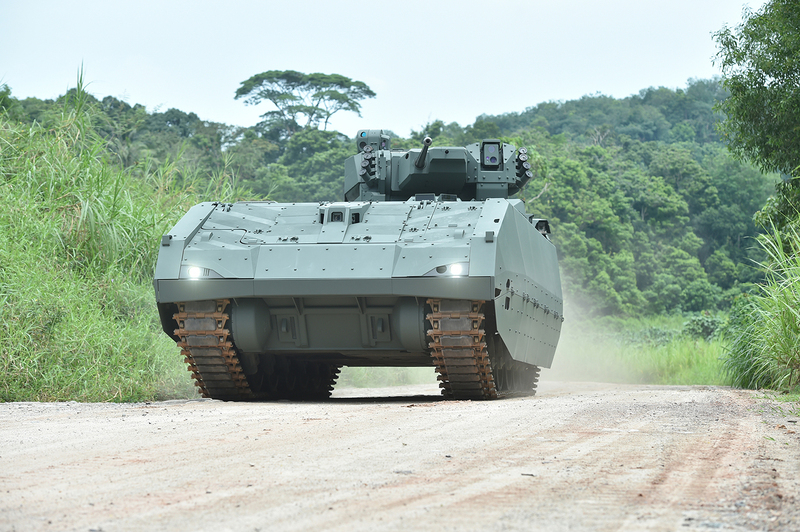 The company is already involved with upgrading the Brazilian Army’s 8×8 armoured personnel carrier (APC) with its Brazilian subsidiary Technicae and with the recent integration of all the companies divisions, ST Engineering can offer solutions to fit the customers circumstances – to do more with less. ST engineering features a number of new products apart from the turreted version of the Terrex 8×8 APC, including its New Generation Tracked all-terrain vehicle (ATV), and a new Endurance 140 Landing Platform Dock (LPD). In the maritime sector of LAAD Fincantieri, the Italian shipbuilder displayed models of new ships for Italian Navy and Coastguard that brings together domestic and international companies, equipment and services suppliers and technologies for the use by the military. The company also demonstrated its XBridge modular multipurpose bridge concept which utilizes its MANTA system that integrates different training methods and tools in a common scenario to cover the most advanced training needs. 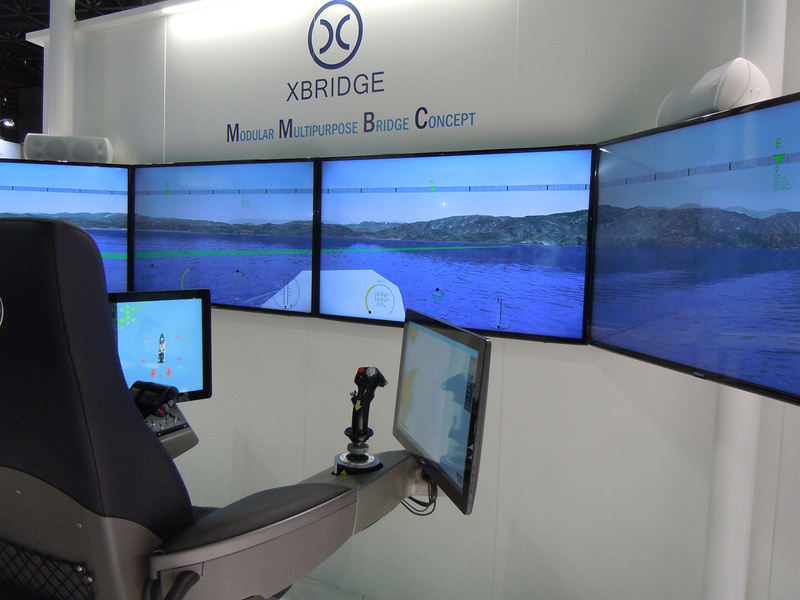 The XBridge could be used as a design tool for a new bridge concept and for the training of its crews. Another international company highlighting its naval capabilities was the India-Russian Joint Venture company BrahMos. The anti-ship version of its supersonic cruise missile is capable of being launched from a submarine from a depth of 40-50 metres. 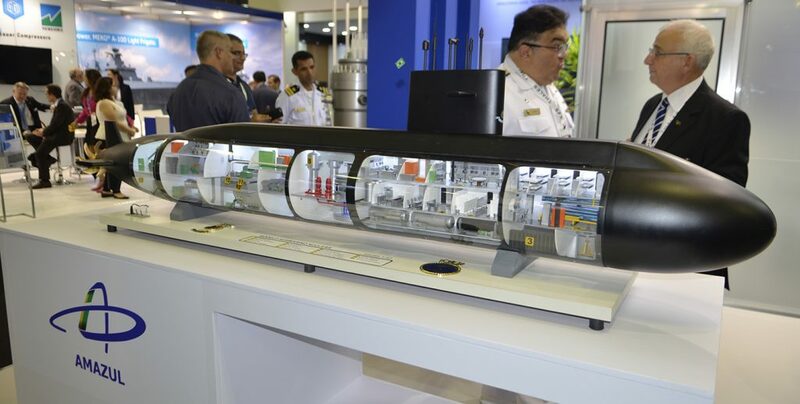 The canisterised missile, which has an identical configuration to the ship-based system, can be installed in a modular launcher vertically in the pressure hull of the submarine. Once the missile emerges from the water, sensors provide out of the water command to hit a designated target at a range of up to 290 km. The first successful missile launch from a submerged submarine took place in March 2013. 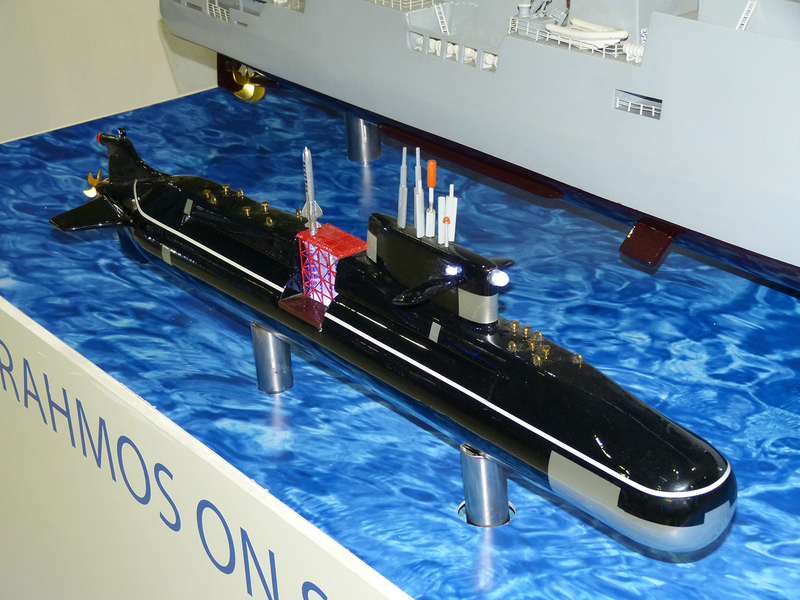 A model of the future Indian Project 79I submarine was shown with a four-missile canister. Integrated life cycle support for military aircraft fleets, focusing on select platforms of jet fighters, helicopters, propeller aircraft, transport aircraft, UAS, and air defense systems, while guaranteeing the support of these systems over their complete service life. The company also produces the twin-turboprop Dornier 228 light transport aircraft, key features of which are its long range, high utilization rates and high payload at low operational costs. RUAG supplies the Dornier 228 as a special mission, passenger or cargo transportation aircraft and has been supplied to the Venezuelan Air Force. Another aerospace company vying to enter the Latin American market is Poland’s PZL Mielec owned by Lockheed Martin/Sikorsky. During LAAD 2017 it demonstrated its M28 short-take-off/landing M28 twin turboprop transport aircraft which is conducting a three-month tour taking in Trinidad and Tobago, Brazil, Argentina, Ecuador, Colombia Panama and Mexico. The 19-seat aircraft has a clamshell rear door for easy loading of bulky cargo enabling the aircraft to be quickly converted for paratroop training, border patrol and casualty evacuation missions. 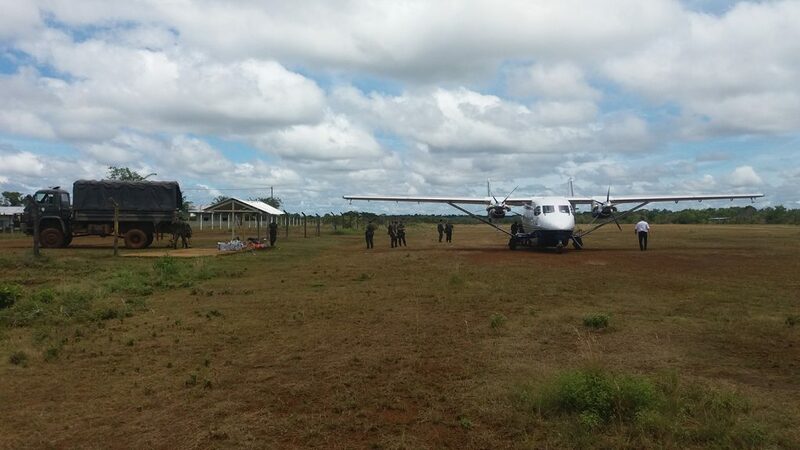 The M28 carried out a series of demonstration flights from short unprepared runways in high temperatures for the Brazilian Army.